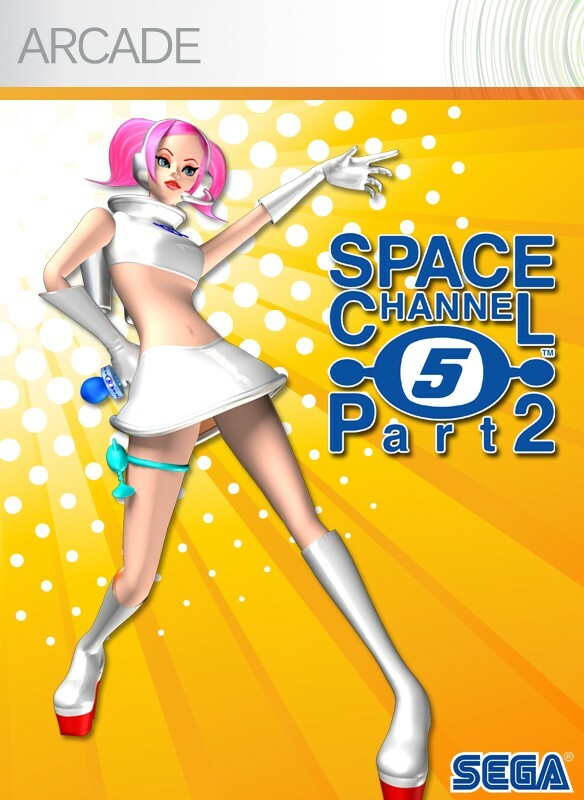 Sega have released Space Channel 5 Part 2 almost ten years ago and the game was initially made for the Dreamcast, when Sega pulled the plug on which was to be their last console, Space Channel 5 Part 2 eventually found its way to being ported over to the Playstation 2. After a long hiatus, the Xbox Live Arcade now greets the game with open arms and with a lick of paint and a HD make over, is Space Channel 5 still as good as it was all those years ago? 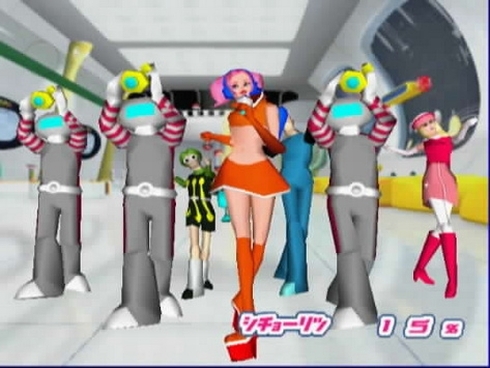 Should Ulala go back into hiding and stick to cameo performances in other Sega games or come out dancing and show that she and her team can take on the best of the best that the Live Arcade has to offer? Only way your going to find out is by reading our full in depth review of the title. The game works very much exactly the same way it did it all of those years ago on the Dreamcast, with the majority of the game unchanged. The whole objective of the game is to dance your way through each stage by matching button prompts to the rhythm that the game sets for each segment of the many dance battles you will encounter. Whoever controls Ulala will have to match button prompts such as X, B, left, right, up and down to make noises/moves that will show up on screen in a majority of different ways depending on where you are in the story of the game. With each button press and each action that happens as said before your character will normally say something along the lines of Chu, Hey or quite simply Up, Down, Left or Right depending on if you need to shoot something or do something which requires Ulala to change direction. Now you may be wondering why when you do a button prompt your character or the enemy will shout things like Chu or Hey at you, well this is quite simple as Chu is most normally used when you have to shoot enemies or objects to progress, where as using Hey will normally make Ulala do a special dance that is only relative to that button prompt. Another feature of using the Hey prompt is that this is what will inevitably save the hostages that are in the game and add to your total score at the end of each segment or chapter. A few new features that the Xbox Live Arcade version has over the original game though is that, you can now do charged attacks which come in the form of holding down the X button which will make Ulala hold the word Chu before you release it at the right time to do an attack, if you over charge it or under charge you will lose a life. There are also instrument battles in which the player must control what is going on by using the two special attacks that you have the ability for but also by using the directional buttons as well, these will normally work in both normal and boss battles that the game throws your way. The game isn�t just all about dancing though and pressing buttons, the whole point of the game is about timing and when you personally think you have timed something to perfection to find that you either have done it correct or you failed the timing aspect wrong somehow. This is obviously a nice and neat little game play mechanic which shows that not all games that come out need to be littered with a whole host of controls and things to do to be classed as a good game. Take for example when you work your way through one of the levels or chapters if you will that this game currently has, every time you get a sequence correct you will normally add one percent to your rating percentage, your rating percentage is what the game will judge you on and could easily be classed as your score because the better you do the better percentage you shall receive. Anyway as you progress, like I said the better you do the better your score will end up being, this is where the game then twists the game play around a bit as for when you take on a boss battle, your percentage is changed into hearts. Your hearts in the game will simulate how many times you can get a sequence incorrect and once you have made enough mistakes in a boss battle, the game will come to an end and you will have to restart from a checkpoint or from the beginning of the level. There are certain segments of the game which are secret, usually you can tell when you have come across or missed a secret part of the game as the screen will flash for quite literally less then a second, if you did manage to activate the secret though you will have to press button prompts just like the rest of the game. In which this will help to turn your enemies into allies. To actually gain a score of 100% viewer rating at the end of each level you will have to spend a lot of time working out where each of the special stages are and how to activate them. If you manage to successfully complete certain secret areas in the game you will unlock the ability of using costumes, each costume comes with a special and unique ability. Each ability is devised to do its best to help the player get out of the tougher areas of the game and some of the later costumes really make the game a breeze to play through, to get these though you will need to play the game an awful lot and fulfil many of the requirements pre determined. If you do actually manage to complete the game you will open up the chance to play a mode called simple �The 2nd World story� in which you will encounter new characters, special effect costumes and dance strings. The mode itself is a whole lot harder then the original game though and adds an extra challenge to the game. The game features the ability of co-op play which is another new feature to the Xbox Live Arcade version of the game, unfortunately though it is Local co-op only but this is because one player will control the directional controllers where as the other player controls the dance moves, adding in co-op was a nice touch as it can make progressing through this game a little easier to bare with. 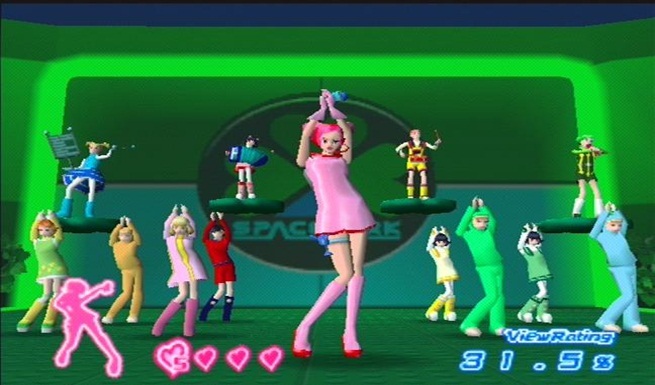 The other mode in Space Channel 5 Part 2 is Ulala�s Dance Mode, this is a continuous dance mode where you have to match the strings of prompts accurately to continue onwards and upwards, whilst the mode starts off easy it soon piles on the pressure and you will find yourself making mistakes more and more the further you progress. Unfortunately though in this mode your only given one life and if you make a mistake then that means its game over and you must start again. The game proves that whilst any game can have simple enough controls, to master them is a whole different kettle of fish. You shouldn�t come into this game thinking you will find it really easy and can complete it in a matter of an hour or two. The game will punish you if you have that mentality, it is a hard game to master and get used to. But in time anybody can become a pro with Ulala and friends. With this game originally releasing for the Xbox 360 on the Dreamcast Collection earlier on in the year, it was apparent that some of the titles had been reworked and remodelled for the new era of gaming whilst others had not. If anybody had any doubts about how Space Channel 5 looks now nearly ten years on, you will be glad to know that the game itself looks as good as it ever did. The game itself has had a major overall with textures and a HD colour palette added to the mix also, with just these few things combined the game looks really great to stare at, i was worried going into the review that the game would have had little attention to the port and would look exactly like it did on the Dreamcast. Even the menus and loading screens have been remade with the old design scrapped, this just proves how much time went into remodelling the game and porting it over to make it feel worth the money that consumers would be paying for it. Backgrounds have been replaced from standard still sets to dynamic and moving real time environments, and the game still holds up well even when there is a lot going on, on screen. Unfortunately though because the game is a port the actual character models themselves were never remodelled so they still look a little clunky around the edges, but with the upgrade the game has received it is easy to forget about that and look at the brightly coloured scenarios the game has to offer. I did also come across some slight motion blur at times when the game would go up close to Ulala or one of the other characters for a cutscene, granted its nothing major but it can affect and detract from what is going on in the game. 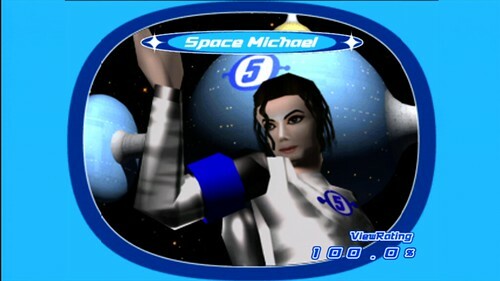 Introducing the one and only....Space Michael, wait what? Being a rhythm game, sound has to be a major part of the game itself. Space Channel 5's best feature easily is this area of the game, some of the voice work borderlines on the cheesy side but seeing as this game was originally intended for Arcade use it is acceptable. The music itself though is where the sound department really struck gold with this game. All of the music used within the game is pretty upbeat and features a nice dancey tone to it, if games such as DDR were around back when this game was devised I could easily have seen this being a full blown dance title instead of the rhythm game that it is. There are many different styles of music also to help compensate what is currently going on in the story of the game or what area you are now finding yourself in. It can be all happy cheery dancy type of music, or it can slow down and be dark and gloomy but still beaty. As the game progresses the beats will too and this is where listening to a song and hearing the beats will play a major key point, as said in the game play area the whole point of the game is listen to the instructions given to you whilst also monitoring what beat that instruction came in on, then you have to replicate it. The later levels are pretty fast so actually managing to pull off every move correctly may prove to be harder for many casual players. There really is no denying the fact that the music in this game would of been great for the era it was made for, when you look at it now it isn�t as great, but with the upbeat dance style that the game as got its easily forgiven and will probably still sound great in another ten years also. Ulala and the un-Technicolor dreamcoat marching band! This game will not be for the feint of heart as it is a hard game throughout, when you first start the game you will be told what to do but the tutorial is rather brief. From then on out this is when the game will stop holding your hand and the rest is up to how skilful you are and if you can match the beats to perfection. The game will technically stop holding your hand after ten minutes and will make you go out and work it out for yourself, but the one saving grace when it comes to the games difficulty is that if you do fail any mission, you can choose to start again from a checkpoint if you do so wish. Add in how hard it can be to collect suits to help your progress in the game to how long some of the routines are as well as how fast some of the routines can be spelled out to you, if you lack attention or get bored easily you may find following this game to be awfully hard to do. For the players who can stick with the game though, they will no doubt find this game rewarding as it does offer a fair challenge and will take some time to complete. I think with a difficulty setting this game could of easily have accommodated younger audiences and it may have helped that they wouldn�t have to keep restarting later levels until they managed to work out the beat and rhythms to each of the dance battles. Some may argue that achievements don�t matter and some will argue that they do and should be fun and challenging, Space Channel 5 manages to take the achievement list and help define what the word Achievement stands for. Only a few of the achievements in the game will easily be obtained whilst the others will require the player to be spot on through most of the game. To make things worse there are achievements for also taking part in Ulalas dance battle and managing to get to twenty five, fifty and one hundred percent of completion. With how hard that mode can be at times it would be safe to assume the twenty five percent achievement would be easily do able but after that getting to fifty would be a challenge. The hardest achievements in the game though will by far be the clear all secret stages and by gaining this you will also be almost set to receive the perfect reporter achievement for getting a hundred percent on all of the levels. As mentioned earlier in the review getting the secret areas and getting one hundred percent is not an easy thing to do, let alone doing it for the whole game. The list is downright hard and i can only imagine that a few people will ever complete the list fully, to help soften the wounds that the games difficulty and achievement list hands to you, the game does also offer a few avatar unlockables for playing the game for both five and ten hours. Both of these will be fairly easy to pick up with how long the game is and the time should just fly by. For a game as old as this is, the port to Xbox Live Arcade was a smooth one and with the improvements that UGA have made to help the title out, the game is better then it has ever been. From the slick HD visuals and textures to the cool upbeat soundtrack everything here will bring back lots of nostalgia for anybody old enough to remember the Dreamcast era. For the price of 800MSP this game is hard to say pass up on, if you loved the game back when it first released then you should probably give it a whirl now and see if you're still as good or possibly even better then you was back then. For newer players or the more casual of the gaming crowd then maybe it is better if you wait for a deal to come into affect for the game.